I know I know I know, as part of Team Flirtini, it's not my challenge week on Drunken Stampers...but come on now...distressed / shabby chic??? How could I not? This is totally my thing...I distress almost everything I make and I love love love the disorganized, messy, old look of shabby chic. In my last post I said I bought a Tim Holtz stamp set recently, my first one...well I have been soooooo excited to put ink to rubber! So this was the perfect challenge. I had originally planned to use another image, but by the time I got done layering everything up and adding all the little things I wanted to, the image would have covered it all up, so I went for one of the smaller sentiments that didn't take up as much space. Fabulous job for the challenge you rock...tfs..and I finally found out how to get your blog to come up so I can comment...so many wonderful things have been happening here and I wanted to let you know its all good. What a fun card! I love all of the gears! 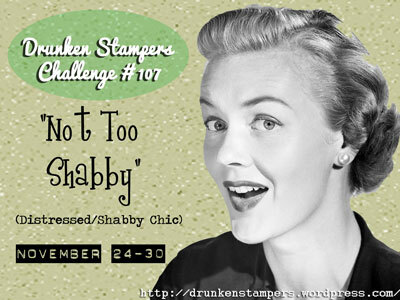 Thank you for joining us this week at the Drunken Stampers Challenge. I hope to see you play along with us again soon!